A collective project by Camilo Ontiveros and Felipe Zuniga. EL CUBO explores notions of social architecture through a transportable sound sculpture whose sound track responds to site-specific locations. EL CUBO is a transformable object that articulates experiences in its interior and its exterior. EL CUBO exists thanks to the conjunctional initiative of different creators with the goal of provoking the eruption of different sonorous gradients, incessant voices, ephemeral chronics and ambient episodes in the city . Unstable, EL CUBO unfolds and loses its defined limits only to replicate the extreme growth from the surroundings to which it tries to echo. Constructed of wastes, signs of the consumption economy, EL CUBO is a kamikaze version of its neutral and white predecessor. EL CUBO unfolds its aesthetic potential in concrete spaces as much as imaginary; it is drop-down architecture, a sonorous intervention in the noise of the city, a specific-social cartography that projects to the public, between the public, towards the public. 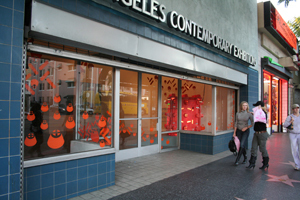 El Cubo is part of Street Address, an ongoing storefront series at LACE that offers a 24/7 art experience to Hollywood Boulevard passersby.